Telangiectasias are dilatation of the capillaries, arterioles, and/or venules of the skin. They are often found in various rheumatic disorders and can provide both diagnostic and prognostic clues for the astute clinician. Their distribution, configuration, associated signs and symptoms, and the medical history of the patient are all important clues to being able to distinguish between isolated lesions and those which require consideration for underlying systemic pathology. This chapter will review the differential diagnosis of mucocutaneous telangiectasias, with a specific focus on the patient with autoimmune disease. The chapter will discuss primary and secondary telangiectasias. The primary telangiectasias include hereditary disorders, generalized essential telangiectasia, and other more rare disorders. Secondary telangiectasias are those secondary to physical factors (e.g., trauma, irradiation) or medications and toxins. This class also includes telangiectasias associated with metabolic or endocrine disorders, such as increased levels of estrogen or thyroid abnormalities. 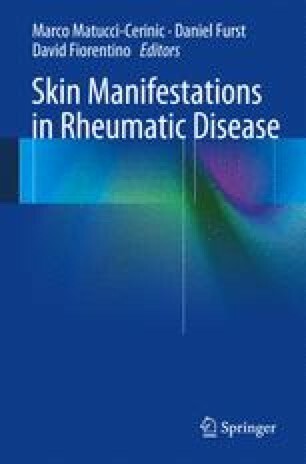 The final group in this class includes inflammatory disorders, including those not considered autoimmune (e.g., acne rosacea, mastocytosis) and the classic rheumatic skin disorders such as lupus erythematous, systemic sclerosis, and dermatomyositis. Photographic examples of classic telangiectasia morphologies are given. Finally, a diagnostic algorithm to the patient presenting with telangiectasias is provided.